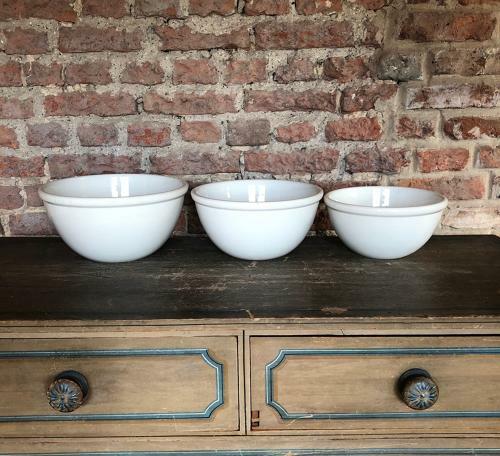 Really unusual to find...lovely heavy white ironstone kitchen bowls..3 gradutating in size. The measurements on the listing are for the largest ie 14.25cm high x 28cm wide and deep. Middle Bowl is 13cm high x 26cm wide and deep. Smallest Bowl is 11.5cm high x 23.5cm wide and deep. No chips, cracks or crazing..all pure white. The central bowl has a few stain spots in the base. All shown on the photographs. They are really heavy so if they are posted its Parcel Force 48 for £15.